We are one of the trusted names engaged in offering a quality-assured range of NANOFOG series of ULV Foggers to the customers. These products are ULV foggers that are widely used for fogging water as well as oil based solutions, with utmost efficiency. Moreover, these foggers split the liquid into very fine particles that remain suspended in the air for a longer time period that stretches the contact period with micro-organisms in the air, resulting in better germ control. Our range of products is provided with a timer device that ensures its flexibility and durability.To make the process more uniform as well as increase the area coverage, these products can also be used with Rotostand. Owing to the robust construction, portable design and simple mechanism, these products can also be used for hand-held operations too. 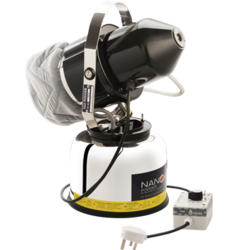 These products can be used to cater to the requirements of aerial disinfection of enclosed areas like hospital O.T.s. I.C.U.s, pharma rooms and others. 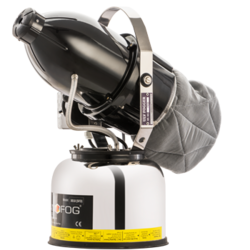 Highest number of features & highest area coverage as compared to any other conventional fogger in its category. High density engineering plastic body to ensure portability & resist chemical attack. Since the supplied liquid is broken into very fine particles on the nozzle assembly itself and the aluminium body does not come in contact with the chemical, internal corrosion and chemical attack is avoided. The unit has a vertical adjustable head and can be rotated horizontally (using our accessory: ROTOSTAND) to gain better direction, maximum results and greater efficiency. Compact design and low weight utilises very little space and the unit can be installed without making any structural changes or modifications. Area Coverage More Than 15,000 Cubic. Fts. 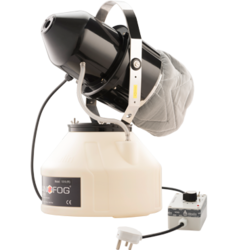 Looking for ULV Fogger ?